The concept of substantial similarity, never clear to begin with, got even more confusing once juries started playing a larger role in copyright infringement suits. A few weeks ago the 9th Circuit issued its decision in the long-awaited “Blurred Lines” case, Williams v. Gaye, and the reaction has generally ranged between dismay and anger. Here is a quick summary of the decision. 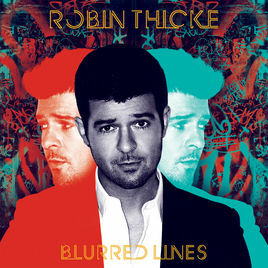 The consensus among copyright lawyers, with some exceptions, appears to be that the original jury verdict against Pharrell Williams and Robin Thicke threatens to make musical styles copyrightable, that the majority on appeal got the law wrong, and that the dissent is correct that the jury verdict should have been reversed. I disagree with some of that, but I want to take this post in a different direction. I’ve been doing a lot of thinking and reading lately about the development of the test for copyright infringement over the course of the 20th century. Williams v. Gaye is, I believe, merely the predictable outcome of the 9th Circuit’s approach to proving copyright infringement, an approach that copyright scholars have been complaining about for a long time. But it’s worse than that. As Rick Sanders spelled out in a recent post, all of the modern tests for proving infringement by copying are deeply problematic. What is particularly intriguing with the Williams case is that the approach the dissent seems to be recommending actually pre-dates the modern caselaw. It’s the one that the modern test — first spelled out in detail by the Second Circuit in Arnstein v. Porter — was designed to replace. Look at the cases the dissenter, Judge Nguyen, cites—many of them were decided before Arnstein. And although I agree with the Williams majority’s assessment of the lack of support for the dissent’s argument, I think it’s no accident it has resurfaced. A warning for non-IP-interested readers: this is going to be a long, hard slog through the weeds of copyright law, maybe several long hard slogs. I also have some things to say along the way about the development of the law generally over the last hundred years. But consider yourself warned. Today’s post will focus on what I’ll call the “standard” test for infringement, and what it was designed to do. Tomorrow I’ll discuss why Arnstein seemed like a workable approach when it was decided, and how our modern conceptual framework of law obscures that. The posts after that will then describe two important, but largely unrecognized, shifts that made Arnstein deeply problematic. And at some point after that, I will get back to the Ninth Circuit’s test, how it differs from the “standard” test, and where it came from. Whew! But first, the “standard” test. The standard test is the one featured in all of the copyright textbooks—a fact which perhaps gives a misimpression of the extent of its actual adoption. It is derived from Arnstein v. Porter and serves as the basis of the Second Circuit test today. How the Second Circuit got to Arnstein is a whole story in itself, one that several people have explored recently, including me. But I will skip over that for now. Arnstein set forth a test for copyright infringement that is a nesting set of elements and sub-elements. First, there are two main elements: ownership of a valid and registered copyright, and infringement of an exclusive right. 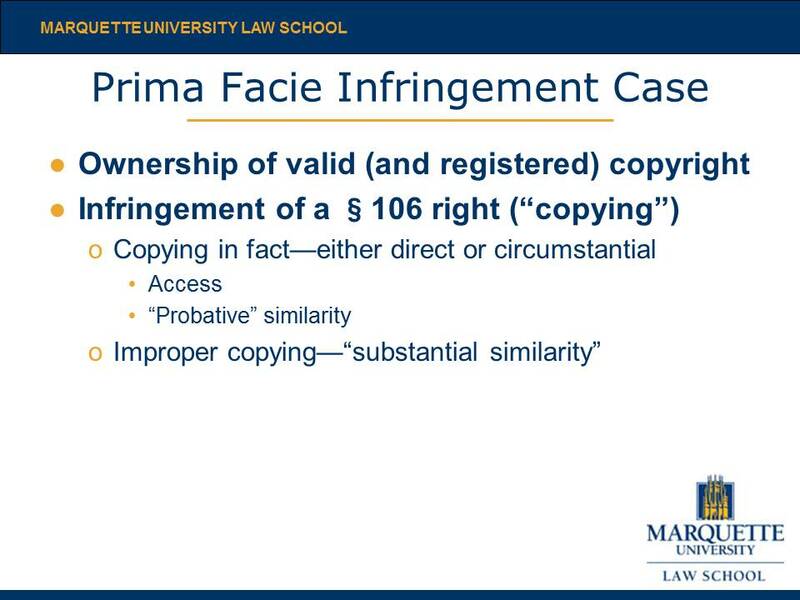 Proof of infringement by copying, the Arnstein court said, consists of two further sub-elements: that the defendant actually copied material from the plaintiff, and that the copying was improper. Proof of actual copying, in turn, can be established in one of two ways, directly or circumstantially. Circumstantial proof of copying involves two sub-sub-elements: access by the defendant to the plaintiff’s work, and enough similarities to permit an inference of actual copying. The main innovation of Arnstein was in splitting the question of actual copying from the question of whether the copying was actionable, and assigning different methods of proof to each. Prior to Arnstein, the question of whether copying was extensive enough to prove infringement had arisen in a number of cases dealing with books, plays, and movies, with courts answering it using a variety of methods. Sometimes judges engaged in a detailed comparison the sequence of events in each work, as well as earlier works, attempting to determine how much the defendant borrowed from the plaintiff, and only from the plaintiff; other times courts considered the impression each work was likely to make on its audience. In Arnstein a majority of the Second Circuit panel, Judge Jerome Frank and Judge Learned Hand, held that both of these approaches were correct. Similarity of various plot points, and other expressive details, could be considered in establishing whether actual copying had occurred. Expert testimony could be admitted in order to find similarities that might not otherwise be visible. The idea was to figure out forensically if the defendant had copied expression from the plaintiff or independently arrived at something similar. The similarity of appearance of the work to the relevant audience, however, was reserved for the second sub-element, whether the appropriation was improper. There the sole test was whether the audience would conclude that the “defendant took from plaintiff’s works so much of what is pleasing” about those works “that defendant wrongfully appropriated something which belongs to the plaintiff.” And that, Judge Frank wrote, was a job quintessentially made for the jury, considering the work as a whole and not broken into discrete bits. The Arnstein majority was specifically trying to avoid a return to cases in which plaintiffs attempted to show infringement by identifying numerous isolated similarities, as Anne Nichols’s attorney tried to do in Nichols v. Universal Pictures by preparing elaborate charts showing similarities in various characters and their relationships. Judge Hand in Nichols, and Judge Charles Hough in Dymow v. Bolton before him, had declared that the test should be more holistic, lest the forest of infringement or noninfringement be missed for the trees of similarities or differences. And like the reasonableness of behavior in negligence law, the test depended on the jury’s reactions to the copied material. Expert testimony was therefore inappropriate on this issue. Second, even when it is clearly identified as a separate sub-element, the definition of improper appropriation has always been subject to a fatal flaw. Arnstein seems to consider a determination of whether the value of the song has been taken as determined by its market audience. Judge Hand, in later opinions, seemed to view it a little bit differently, as whether the “aesthetic appeal” of the plaintiff’s work had been taken by the defendant. But both determinations are difficult to state in words, in order to guide lower court judges or, later, juries. Neither of these difficulties was fully appreciated until long after Arnstein, for a very simple reason: copyright infringement cases almost never were tried before a jury. Arnstein itself featured one, but it was the rare case, probably because it was being litigated by Arnstein pro se. He had neglected to ask for an injunction, which meant that his suit was at law, not in equity; and even more unusually, he had demanded a jury trial. Although the merger of law and equity in 1938 had abolished separate equity procedures in the federal courts, courts still heard any case requesting both injunctive relief and damages without a jury as they would have under the old equity rules. In 1959, the Supreme Court in Beacon Theatres v. Westover abolished this practice, making clear that any request for a non-equitable remedy meant that the Seventh Amendment right to a jury trial attached to the entire case. 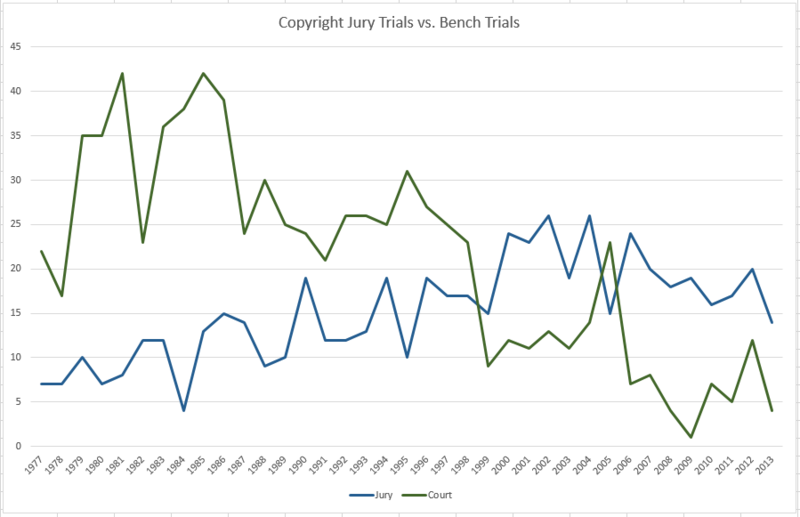 Despite this, copyright lawyers on both sides generally declined to ask for a jury trial, meaning that the vast majority of appeals to the Second and Ninth Circuits throughout this period were from bench trials. This pattern held in both patent and copyright cases—and then, in both fields, shifted in the last 40 years, for reasons that are not at all clear. This means that the problem that confronted the district court in the “Blurred Lines” case—how to instruct a jury on the issue of infringement—simply did not exist, as a practical matter, for most of the twentieth century. Well before infringement jury trials became the norm, however, the Second Circuit started reformulating the test for infringement in a way that made it even harder to tell how taking the “aesthetic appeal” differed from mere copying of copyrightable expression. Tomorrow I’ll talk about what the Arnstein panel may have been thinking. Previous Previous post: Will a Wisconsin Benefit Corporation Benefit Your Start-Up?